Plastic is our daily bread. No, we’re not a fish at sea. But we are working – just like you – in this industry, which is currently being pilloried worldwide. In the course of this hunt, we notice in bewilderment the discussion on banning small and very small plastic parts, which the EU Commission has kicked off with petty actionism. Instead of reaching for the stars, Brussels clings to straws and cotton swabs. It is, of course, clear to everyone that the banishment of such plastic parts does not solve the problem. Such actions are eyewashing and hinder the development of sustainable solutions, as they obscure the real cause: The problem is not the plastic part, but the hand that drops it. In this part of the world, this often happens out of laziness, because the way to the next dustbin is “so far away”. However, billions of people worldwide have no access to a functioning infrastructure for waste collection and recycling. The plastics industry and its associations are making an important contribution to solving this problem with a wide range of commendable initiatives. The current 4th Marine Litter Solutions Progress Report* has a whole series of encouraging success stories to report. They range from the Eco-Ranger Program in Malaysia, which is held in primary and secondary schools and which is designed to educate students about waste management, over to the so-called Net-Works project that has successfully developed a community-based supply chain for ghost fishing nets in the central Philippines, to the zero pellet loss initiative of the plastics supply chain in Germany. Reading the report is always worthwhile and also provides a good argumentation aid for companies in the plastics industry that are under pressure to justify themselves. According to a study** recently published by the German Fraunhofer Institute for Environmental, Safety, and Energy Technology (UMSICHT) elastomers account for 49 % of the microplastics emissions (defined as anthropogenic polymers in the environment) in Germany. Tyre abrasion is leading the Top Ten of microplastics sources in this study (although it is of course not “microplastic”, but “microrubber” and as such has to be viewed differently anyway), while plastics packaging ranks 8th (by the way, still behind the abrasion of shoe soles!). From this it becomes evident, that sustainability of a product is determined by the whole life cycle. In this respect research and development in the rubber industry must take account not only of production and disposal but also of actual use and application of rubber. A lot of solutions for more sustainability are being worked on in all areas along the value chain: starting from sustainable production (e.g. sustainable plantation management for natural rubber or optimised, less energy and material consuming production processes), continuing with optimisation of rubber properties and minimisation of emissions during use (e.g. by optimisation of the properties of tyre compounds using fillers such as silica), through to studies on rubber recycling (e.g. as ground rubber). The rubber as well as the plastics industry are faced with the task of reawakening awareness for their products as valuable materials that serve a special purpose in many applications, due to their tailor-made properties. At the same time, trust will have to be built in sustainability and recycling concepts by accurate and comprehensive information. We will report on successful projects of this kind in the next issues. On 3 July 2018, Reinhard Danzer, who has been in the commercial management of LWB Steinl since 2007, was appointed co-managing director of LWB Steinl and STG Stanztechnik by managing partner Peter Steinl. The Steinl Group expects to gain even more presence and stability with this dual leadership. In addition, Reinhard Danzer will remain CFO and continue to be responsible for the commercial area of the group. In his new position, the new co-managing director was available for an interview. Pneumatic tires intended for severe service such as truck tires may be composed of elastomers comprised primarily of natural rubber with a minor amount of polybutadiene rubber to promote resistance to tread wear. Moreover, the partial replacement of carbon black with precipitated silica is becoming popular in the tire industry, in order to achieve a balanced condition between properties like rolling resistance, wet grip and abrasion resistance. 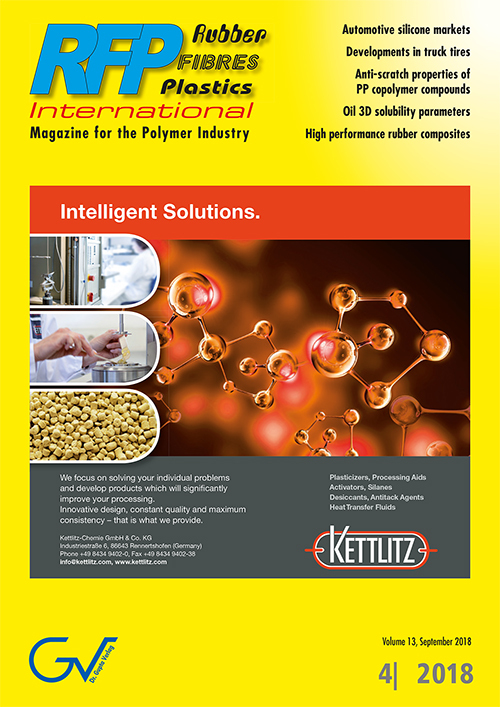 To optimize such complex formulations low Tg SBR may be introduced, from emulsion or solution polymerization, combined with the presence of functional groups for a better filler-polymer interaction. An investigation is presented for providing tire tread compounds for medium severity service, characterized by reduced NR content, dual-filler reinforcement and containing S-SBR grades produced through batch and continuous technology, with or without functionalization. Targeted key properties are low hysteresis (lower rolling resistance, reduced heat build-up) together with good processability and wear resistance (tear, abrasion). Besides performance optimization by selected polymer blends, the fossil oil required in the investigated formulation (naphthenic) is replaced by a bio-sourced plasticizer. The proposed green oil is obtained via a highly sustainable bio-refinery production step offering several benefits, including improved environmental footprint and enhanced performance. The proposed novel plasticizers provide opportunities to extend the idea of green tires to heavy duty application. The automotive industry’s increasing use of plastics and trends such as driverless cars are spurring demand for improved part aesthetics and long-term performance in vehicle interiors. Consumers expect their car’s interior to maintain an attractive visual appearance, pleasing tactile properties, and consistent quality. According to a report by the American Chemistry Council, in 2016, polypropylene (PP) was the leading resin used in lightweight vehicles in North America (84 lbs/vehicle) . 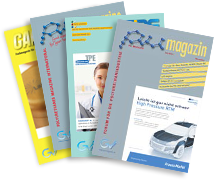 Silicone-based technology can deliver improved anti-scratch properties for PP ­copolymer compounds used in automotive interior parts – without negative effects on mechanical performance. This technology surpasses organics by providing stable performance over the part lifecycle and avoiding exudation (stickiness) on the part surface. 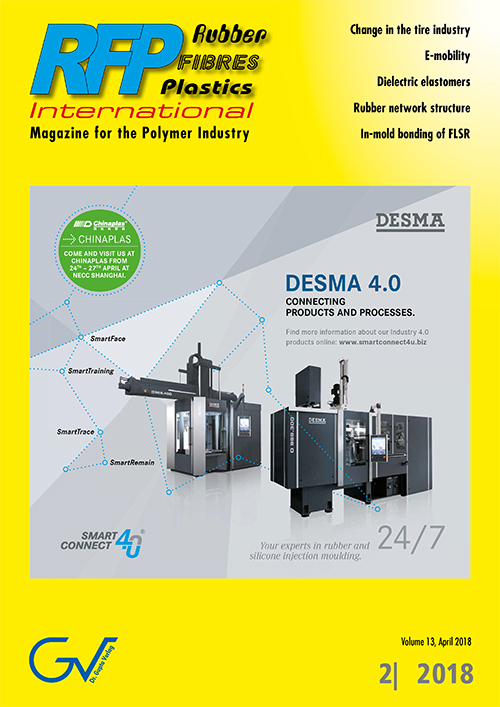 Process oil/polymer interactions have effects on compound processing and performance. 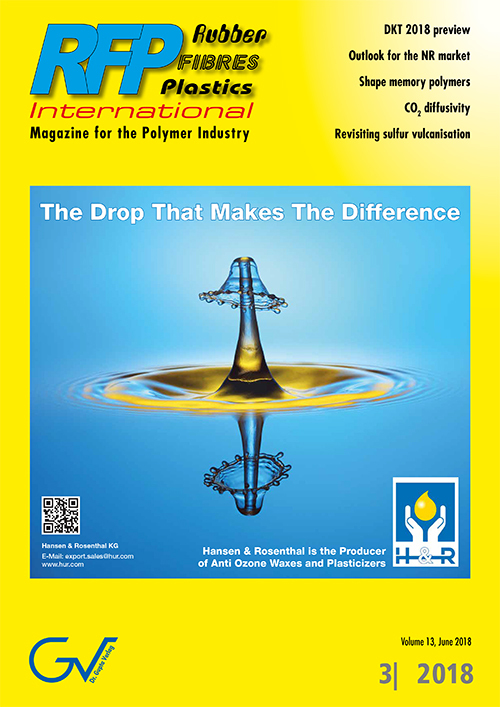 One way to predict oil/polymer interactions is to determine the Hansen 3D solubility parameters for both oil and polymer, and the polymer solubility sphere radius. A polymer characterization technique for determining the HSPs is established called the bitumen solubility model (BISOM) method. However, no simple procedure has previously been documented for estimating the 3D HSPs for an oil. The oil solubility parameters estimation procedure (OSPEP) described here has been developed to meet the need for a relatively simple characterization technique. This procedure can provide an estimation of oil HSPs by running two titrations and a dynamic scanning calorimetry (DSC) test. Analysis involves an iterative procedure to estimate the three HSPs for the oil. OSPEP represents a step forward to easily obtain insight into oil/polymer interactions. Solution styrene butadiene rubber (S-SBR) and silica-based composites are prepared by hydrolysis of tetraethylorthosilicate (TEOS) in presence of an organic solution of styrene butadiene rubber and n-butylamine as catalyst. Addition of bis[3-(triethoxysilyl)propyl]tetrasulfide (TESPT), a silane coupling agent, improves the performance and properties of the composites. All the results are compared with composites containing commercial precipitated silica at similar loading. Part 1 describes the investigation of silica flocculation and filler network analysis as well as the rheometric analysis. The silica particles generated from this alkoxide route result in lower Mooney viscosity of the compound and show less filler flocculation compared to standard commercial precipitated silica in reference compounds. In part 2, a detailed dynamic mechanical study indicates that alkoxide silica in model tire compounds could offer a lower rolling resistance and a higher wet skid resistance compared to the reference. Other properties such as heat build-up, rebound resilience and hysteresis loss are found to be very promising for alkoxide silica composites, too. The silica particles (aggregated) developed by the alkoxide method are found to be relatively large, in the range of 150 nm to 200 nm, as compared to the primary particles of precipitated commercial silica. 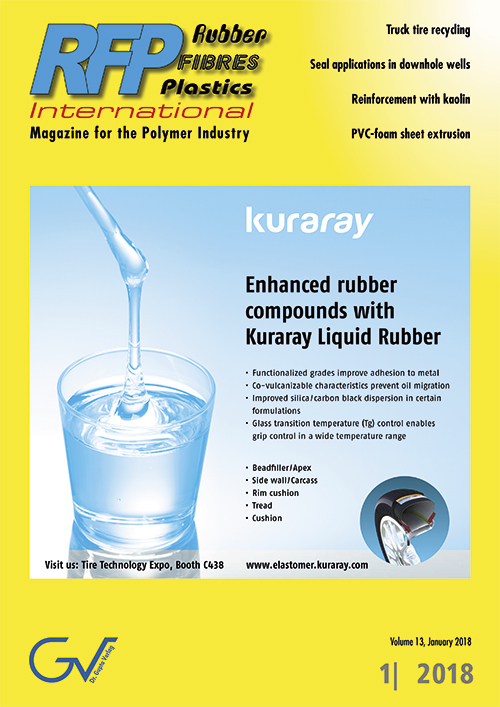 The synthesis of sol-gel silica particles in presence of the polymer allows to trap some polymer molecules inside the filler aggregates and, therefore, offers exceptional mechanical reinforcement of the rubber. For many decades, the German company Fecken-Kirfel has been a global specialist in cutting machines for processing rigid and flexible polyurethane foams, rubber, cork and similar materials. At its headquarters in Aachen, the company manufactures and continuously develops innovative cutting solutions taking into account current trends and new technological possibilities. According to Fecken-Kirfel, users particularly appreciate the precision and reliability of the machines as well as their profitability and efficiency. Comprehensive services complete the offer. Investments in production and modern software solutions ensure good conditions for the team of more than 200 employees to continue to offer optimal cutting solutions and be prepared for ­future challenges in various industries. Interest in production units for large-format moulded parts began to tick up at the end of the 1990s and intensified towards the turn of the millennium. Press forces of 100,000 kN and more have long since been achieved. Today, products measuring in excess of 15 m2 are manufactured on Wickert presses. The specialist in elastomer press manufacturing, based in Landau/Pfalz, Germany, has extensive know-how in the development and production of large presses. This article presents examples and special features on the topic of large presses.